Here is my slightly ranked list of Top Ten Releases for 2014 -- with Spoon definitely taking the top spot. The best thing about compiling such a list is revisiting these songs that became the soundtrack to my life this year, and remembering how these albums are all worth many more plays from start to finish. I was also lucky to see three of the bands/artists over the course of the year so I've pulled videos from the NMMatterscorp YouTube channel from those shows: Spoon, Beck, and Elbow. For the others, I looked for live performances in order to imagine hearing the music being played live: from official gigs at CBS, an AMEX event, and Pitchfork festivals, along with studio sessions from my favorite online radio stations KCRW and KEXP. Check out anything you haven't yet, and enjoy! After taking some time off since 2010's Transference, Austin-bred band Spoon reconvened last year to put together what may be its best album yet. With the strength of the singles "Rent I Pay," "Do You," and "Inside Out," I've heard more Spoon airplay than ever, never a band thing. Spoon opened up for Arcade Fire when we caught the final night of the tour in Montreal, where many in the crowd had not yet heard of them (thus the chatter in the video, but listen to the squeals of delight as uber frontman Britt Daniel approaches each side of the stage!) The guy next to us vowed to purchase the new album immediately and tell all his friends about Spoon when he returned home. When we first listened to this album (studio collection number twelve for this prolific musician), husband/music guru Paul exclaimed "Who broke Beck's heart?" It's that melancholy side of the guy heard back in 2002 with Sea Change, all slower meters and dreamy textures. But at least it wasn't the folky Beck seen at festivals the last go around (still say he could loose the goofy black hat). At least I could finally check him off my concert bucket list after a night at Hammerstein Ballroom in NYC -- a night split in half between the new and yes, all the old hits! The sound of Guy Garvey's voice brings warmth and depth of meaning to any lyric, so why not elongate the title of the group's sixth album too? Everything reads like a stream of consciousness travel journal after time Garvey spent in NYC where "folks are nice to Yoko." I caught the U.K. band in May at Webster Hall NYC, where a couple took this romantic music to another level with a marriage proposal. Some Wye Oak fans didn't know what to make of the duo's fourth album, after singer Jenn Wasner learned the bass and layers of electronics were added without the signature guitar sound. I gladly heralded this move into complexity and Shriek was on heavy rotation all summer. Conor Oberst released his sixth album as a solo artist, connecting to his story telling vibe and touring with the band Dawes as backing musicians. The sound is at once full yet immediate, baring his Nebraskan soul in songs about adult responsibilities and looking for meaning in the every day. 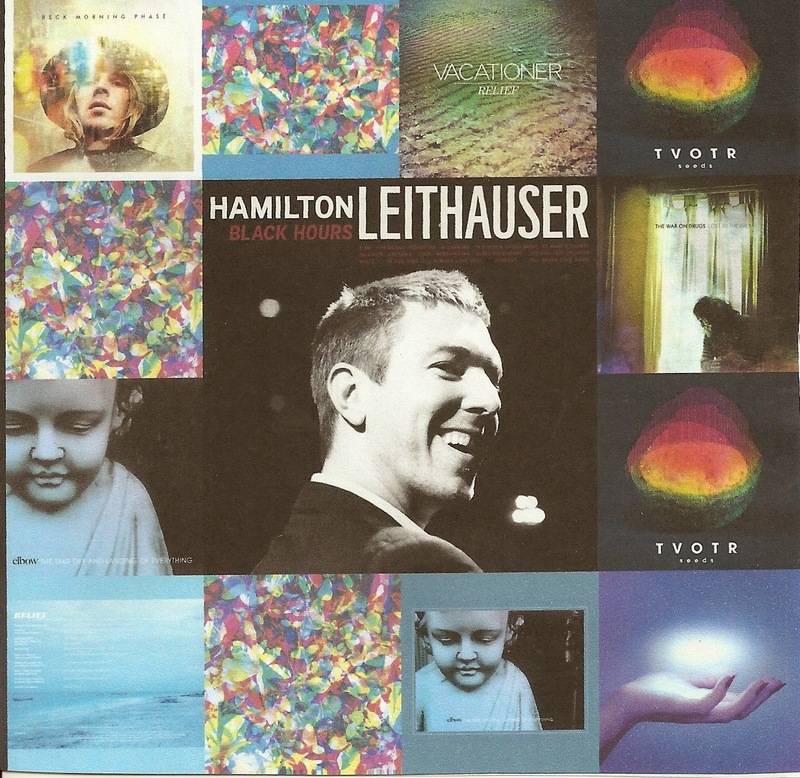 When I fretted about The Walkmen taking a hiatus, it was really the idea of not hearing Hamilton Leithauser's ardent vocals without a solid band base that had me worried. His solo album seemed a bit solitary in spirit, but not in musicianship. The entire collection appears ready made for a full listen seamlessly from song to song. The mastery and wash of guitar reverb permeates this third album by Philadelphia's The War on Drugs. Singer/songwriter Adam Granduciel had trouble adjusting after the successful tour behind 2011's Slave Ambient, resulting in these profoundly emotional songs. St. Vincent's Annie Clark not only garnered attention for this self-titled fourth album, but for her choreographed stage shows performed with her usual epic shredding on guitar. Her songs cut to the quick musically and lyrically, while remaining deeply ambiguous and intriguing at every listen.